Book your tee time on these special dates and receive exclusive rates! We value every member of our golf community and believe you deserve to be treated. Play and pay the lowest rates we have to offer, ONLY available on the dates listed below. 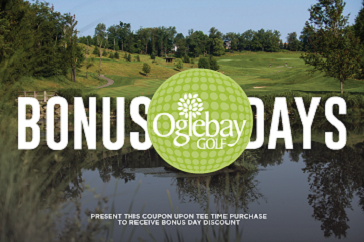 Print Coupon Here: Bonus Days at Oglebay! Must Print or show coupon to shop attendee via smart phone or other devices. Rates only available on Bonus Days listed. Special rates not valid for tee times within 5 days of play. Senior specials valid for ages 60 & older. Not valid with other specials, leagues, outings, events, packages, discount cards or memberships.